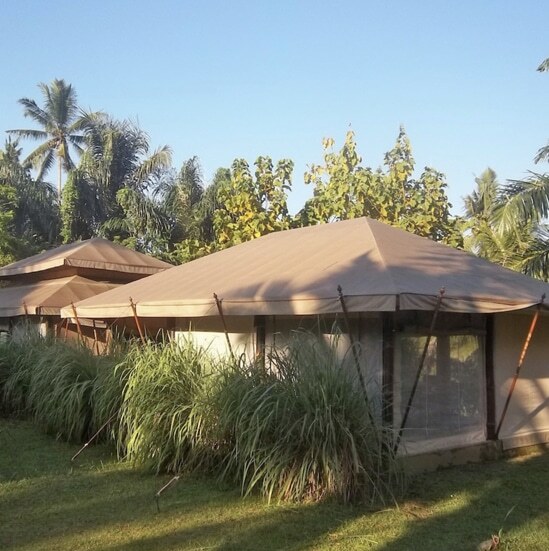 Oiginal Glamping‘s one of the most spacious (65-sqm) designed for humid climates with wide-open walls. The tent includes a galvanized metal frame clad with bamboo and high quality textile. Air-cooled tropical villa tents have a romantic air and an atmosphere that give you the feeling you are stepping back in time. All canvas tents have wall-to-wall and ceiling to floor fabrics tied down to the floor and can be with lock for extra safety feeling. Suited for a seasonal operation but can be easily moved too.